It is not uncomplimentary to call the late M.V.G. Appa Rao, better known as Kanni, a tennis addict. Few amateur tennis players would have travelled so extensively and played so much competitive tennis as Kanni did in the 1950s, ’60s and ’70s. Imbued with the amateur spirit, he played for honour and pleasure, so much so that defeats, instead of dampening his enthusiasm, served to stimulate his appetite for more and more tennis. Coming from a Zamindar family in Andhra, Kanni moved to Madras in the 1930s in pursuit of education and found more than just studies here. He took to playing tennis at the age of 13. He was enthralled by the game which eventually played a dominant role in his entire life. Joining Presidency College in 1943 gave a significant boost to his tennis. He became the best player of Madras University when he won the Stanley Cup (the foremost Collegiate singles trophy) twice, in 1946-1947. 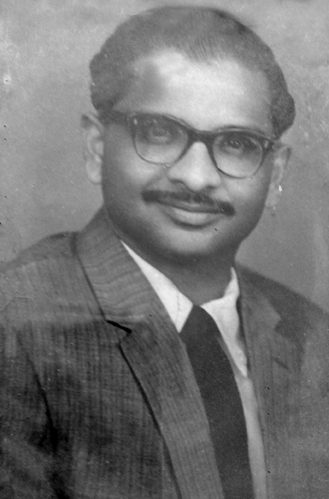 He was also part of the Madras University team that won the All-India Inter-University Championship in 1949. After his M.A in Political Science, he left for England in 1951 for higher studies. Inevitably, tennis totally eclipsed Political Science! Playing tournaments on the grass courts of England, he nursed an overwhelming ambition to play matches on the manicured lawn courts of Wimbledon. Although he did not qualify for Singles and Men’s Doubles, he made it to the Mixed Doubles in 1952. Then came a long period of participation in tournaments in Indian States and also in England, Europe, Sri Lanka, Singapore and Kenya. He was once ranked No.4 in India and continued to be one of the top players in Tamil Nadu, especially in Doubles. 40 years have passed since his premature demise at the age of 52, yet his memory remains strong in the minds of his friends. His excessive adoration of tennis, knowledge and experience of the game, sportsmanship, reporting skills and generous hospitality, combined with a touch of absent-mindedness, made him one of the most colourful personalities on the tennis courts. Even today, anecdotes about him abound in tennis circles. He was a serious contender on the court but was too much of a gentleman to have the killer instinct. In triumph, he was subdued, in loss he was graceful and his sense of fair play went beyond observing the rules in letter and spirit. When playing in clubs, he always graciously gave his place to others. His close friend and compatriot P.S. Seshadri, now 87, recalls an incident: “Kanni was playing an important doubles match in the early 1950s. At a crucial moment, the opponents hit a shot that just narrowly missed the line and the umpire rightly called it out and the opponents themselves felt it was out, but Kanni went and inspected the spot on which the ball landed and signalled it was in, much to the annoyance of the umpire and the delight of the opponents!” Such instances were not unusual with Kanni. In the 1960s, Kanni often went to England in summer to play in tournaments and also cover Wimbledon for leading newspapers in Madras. In 1967, however, a paucity of foreign exchange put his trip to UK in jeopardy, and he was advised to meet a senior official in the RBI in New Delhi. At the Bank, when asked by the receptionist whom he wanted to meet, he forgot this gentleman’s name! By a rare stroke of luck Kanni and the receptionist managed in due course to identify the official he sought. Kanni’s absent-mindedness led him to such piquant situations many a time. Kanni believed tennis was the universal remedy for all human ills and encouraged his friends and relatives to benefit from playing the game. Indeed, some of his family members were good tennis players. They included his daughter Namratha, (better known as Dimpu and now living in the US; she was once among the top women players in India), his late brothers, M.R. Appa Rao and M.S Appa Rao, and sister Kannamma. Though not a player herself, his charming wife Dolly offered full support to his tennis. She remembers that even on their honeymoon in 1960 on board an Italian luxury liner, he had taken his tennis racquets, as there were tennis facilities. But, apparently, he didn’t play! It was a privilege to have known and played with this extraordinary tennis personality.